This anthology highlights exceptional short fiction rooted in the western United States by both emerging and established writers, including T. C. Boyle, Yiyun Li, Philipp Meyer, Antonya Nelson, and Sam Shepard. Best of the West: New Stories from the Wide Side of the Missouri , an annual anthology of exceptional short fiction rooted in the western United States, debuted in 1988 and continued publication until 1992. Recognizing that the West remains rewarding territory for literary explorations, James Thomas and D. Seth Horton revived the series in 2009. 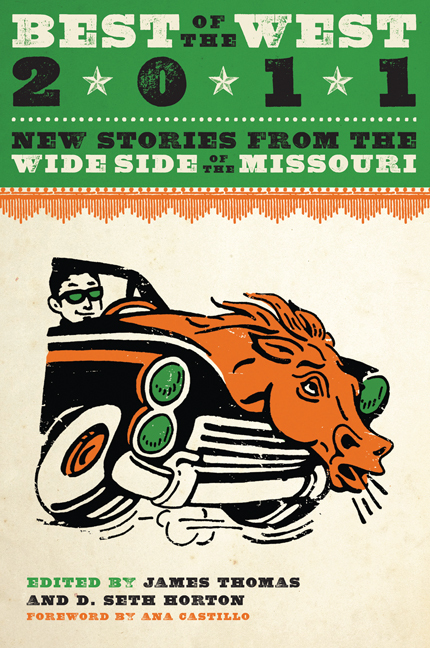 Best of the West 2011: New Stories from the Wide Side of the Missouri is the latest volume in what has become one of the nation's most important anthologies. Editors Horton and Thomas have chosen twenty stories by writers including Rick Bass, T. C. Boyle, Ron Carlson, Philipp Meyer, Dagoberto Gilb, Yiyun Li, Antonya Nelson, and Sam Shepard. Subjects vary from an Idaho family that breeds lions and tigers with disastrous results, to a Mormon veteran whose mind is taken over by a nineteenth-century consciousness, to a Texas boy who spends an afternoon with Bonnie and Clyde shortly before their deaths. Taken together, these stories suggest that the West has become one of the most exciting and diverse literary regions in the twenty-first century. James Thomas coedited (with Denise Thomas) the first five volumes of Best of the West: New Stories from the Wide Side of the Missouri . He has taught fiction at the University of Utah in Salt Lake City and at Baylor University in Waco, Texas. D. Seth Horton, who holds an MFA in creative writing from the University of Arizona, was fiction editor of the Sonora Review . He previously edited the collection New Stories from the Southwest. It was after participating in a sweat lodge in Sacramento, California, that I decided to move to Albuquerque in 1990. The lodge was run by a Chicano activist and artist of the previous generation, and I had participated numerous times in his lodge. I had dreamt of New Mexico in early adulthood, before having ever traveled there: my destiny in later years. While I don't recall the exact message that I received during that ceremony, it felt right that I should move to New Mexico (where I had only the most tenuous connections). It turned out to be a challenging relocation but a defining one. I not only finished a book of essays but also placed them at the University of New Mexico Press. I also produced a novel soon after, thereby joining a long, honored tradition of work that falls within the realm of that which I refer to as mystical. A few years later, life caused me to relocate once again. However, a decade after that, I returned to New Mexico. As before, the decision came after a "message." This time it was a recurring dream in which there was a home waiting for me in the southern part of the state, which turned out to be true. It became the place where I received the inspiration for my next novel, The Guardians . Mystical experience, which is centered on seeking union with God, falls mainly into two types: extroverted and introverted. In extroverted mystical experience, a mystic looks through the physical senses into the external world to find unity. In introverted experience, a mystic looks inward. 1: the experience of the mystical union or direct communion with ultimate reality reported by mystics. 2: the belief that direct knowledge of God, spiritual truth, or ultimate reality can be attained through subjective experience (as intuition or insight). 3: vague speculation: a belief without sound basis. "Vague speculation" and "belief without sound basis" lay the fertile ground in which fiction may take roots and flourish in the hands of imaginative writers. The literature of the West has a number of familiar characteristics. We call in the sheriff, paint the adobes in the background, or find our characters on homesteads, ranchos, or reservations. The horses are noble, and folks work hard for a day's pay. We are often treated to the ever-roaming white missionaries, Holy Rollers, snake oil salesmen, drifters and grifters, and the sons and daughters of African slavery and early Chinese immigrants. Throughout the twentieth century and into the present, as open spaces were overtaken by asphalt and concrete, la puta with the heart of gold has remained; however, railroad bandits have transformed into gangbangers, and the not-so-new comers now constitute a flow of migrant workers. Despite these changes, luscious landscapes, prismatic mountain ranges, expansive deserts, red rocks, cacti, and endless skies are still present. The conquest of the western territories of the United States by Europeans brought about a body of literature that was as much a spiritual response to place and time as a political one. Community-minded writers, especially from marginalized groups, more often than not, chose collective storytelling, whether delivered orally or with the pen. Or they offered their accounts by dictation. Two examples come immediately to mind. They are important because I think they demonstrate how both internal and external mysticism affected entire communities whose spiritual perspectives were being dismissed for the sake of the supplanting religion of the conqueror. A quintessential example of both a mystic and a prolific writer is a nun of the early seventeenth century who never set foot in the New World. Her name was María Jesús de Ágreda of the Poor Clares, and she wrote what became arguably the church's most controversial and famous book in the realm of mysticism: The Mystical City of God . During her career, Sister María played an unusual role in the exploration and colonization of New Spain and the Southwest. She claimed she had visited those lands via teleportation (the ability to be in two places at once, as recognized by the church). During her raptures, she claimed to visit "tribes" in North America. An investigation was eventually pursued, and it was verified that indeed, in northern New Mexico, an encampment awaited conversion at a mission after being visited via teleportation by the "lady in blue." The other example is an American classic: Black Elk Speaks . It is the work of two collaborators: Black Elk, an Oglala Sioux holy man who tells his life story, and John G. Neihardt, a white man who interviewed Black Elk at the Pine Ridge Reservation in 1931 and fleshed out and gave artistic form to Black Elk's account. He claimed to have been spiritually moved to write down the medicine man's life. As for Black Elk, he felt his own story was important only because it was also the story of his people. Neihardt later produced an epic poem, Cycle of the West . It told the story of the Ghost Dance and culminated in the massacre at Wounded Knee. Such an endeavor leads one to wonder whether it was not spirit (or something akin to it) that inspired the author to continue exploring a topic for a period of more than thirty years. Other ethnic groups have also contributed to a literature that deals with a harsh history of settlement and displacement as well as with religious and spiritual conflict. Rudolfo Anaya's animist classic Bless Me, Ultima reminds us of the Hispanic and Native traditions of New Mexico during the mid–twentieth century, a time when Anglo culture began to pervade and dominate the culture. The land's indigenous and Mexican spiritual beliefs are entwined with its recent incorporation into the United States and its prevailing Anglo norms. As opposed Protestantism, which established the country's tenor in the East, Catholicism, brought by Spaniards in the settling of the Southwest, has played an influential part in the imaginative literature produced there. In some ways, although centuries have passed, writers are, at present, as haunted by this legacy as ever. María de Jesús Agreda was the daughter of a Jewish tax collector for the monarchy. He became a converso (thereby keeping his job and his head), and his daughter became a spiritual advisor to the king. The Inquisition was underway during the conquest of the New World. It should not be a surprise, then, that not a few Hispanic families today have discovered that their ancestors were also conversos. One such writer is Kathleen Alcalá, who resides in the Pacific Northwest but takes her family's history as the inspiration for her writing. In The Desert Remembers My Name , a collection of essays, she explores her family's crypto-Jewish heritage in Saltillo, Mexico. Despite Anglo cultural dominance, as seen, for example, in English-only laws and a racialist movement that recommends Anglicizing Spanish place names in order to eliminate all references to the early Catholic friars, writers of various cultural backgrounds who migrate or immigrate to the area can scarcely ignore the religious permeation of Catholicism and an ongoing lived indigenous spiritual presence. Chicanas, because of our own mestizaje and marginalization by Anglo culture, may take on the topic of mysticism in our lives as part of our personal and political journey. The most popular example of this is the essayist Gloria Anzaldúa. She embraced what she may have thought was a complexity of marginalization, which she both embodied and simultaneously addressed in her writings. Unlike John Rechy (born in El Paso), who dealt with sexuality in his books long before he turned to a Chicano theme ( The Miraculous Day of Amalia Gómez ), Anzaldúa, as a feminist of her generation, found it necessary to discuss her body (sexuality and gender) as part of the colonization of Mexicans and the indigenous by utilizing the U.S.-Mexican border as a symbol of that conflict. At present, the trauma of the conquest and its consequent alienation of mestizos and the indigenous of North America are evident in symbolism and metaphors related to the human spirit produced by writers of the area. This is found no less so in popular genres. Tony Hillerman, a white man, found it impossible to write detective novels in New Mexico without integrating the spiritual beliefs of the Navajo characters in his stories. Aaron Albert Carr, a contemporary Navajo Laguna writer, finds mystical connections in the vampire genre, which can be read as either fantasy or an intrinsically mystical worldview related to Navajo beliefs. Vampirism may also be understood as a metaphor for racialist invasions of existing cultures. Five hundred years after the initial evangelization of Native Americans, its impact continues to be rich fodder for new generations of western writers. My latest novel, The Guardians , which takes place near the U.S.-Mexican border, is as much about the fervor of the faith of Sor María de Jesús and her use of national loyalties to justify the conquest of the New World as about the equally heated claims of the U.S. government to the borderland territory. In no way, however, should the political intent (whether conscious or unconscious) in these examples be seen as more significant than the conscious spiritual force that drove the storyteller to take on the arduous task of writing. For nothing brings a writer more pleasure (and more anguish) than the process of joining the tradition of a body of literature. However, long before the acknowledgment of this intent is the initial motivation: that of witness. In Ceremony, Silko reminds the reader of the power of recording legacies in the face of hostile takeovers: "Their evil is mighty but it can't stand up to our stories."